Here you can download as a pdf file all our Techtalks we did for Imotorhome so far. Due to double duties- we decided to release latest updates, new product informations and events from now on direct on our Facebook page. There was a huge request from customers regarding keeping their campers charged up while NOT in a Caravan Park. For home use or when you staying at a friends place- this adapter from 15amp down to 10 amp is safe and practical to use. Southern Spirit impressed with their nifty Vacanza layout. We have now published our services at the new RVpages website which is part of the CMCA network. Check our special offers for CMCA members when it comes to a new conversion fitout. We delighted to bring this precise german made product into Australia. Votronic is one of the premium suppliers when it comes to power management and monitoring. Battery monitors, which show you the stage of your batteries, clear in voltage, % or like a fuel gauge. You can check how much solar power you actually feeding into your house battery or how much you consume right now. Also the tank level indicators working on very accurate probes in 10% stage. Ask as about more details- Votronic products can be also retro fit to many existing fitouts. Planning to buy a Motorhome or Caravan? Don't like surprises!! Unsure about dampness in your home on wheels? We have the latest technology testing tools to proof and spot wet areas, damp corners and what's going on behind your walls. Dampness test from only $89 onwards- please call us to book in! 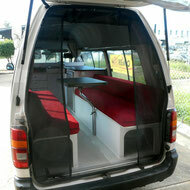 For the first Fiat professional Expo in Queensland we designed, developed and build a campervan conversion. The highlight: the conversion can be taken in and out in under 30 minutes. Ideal to use the commercial during the week and convert for your getaway on the weekends and Holidays. Smart idea- isn't it!? 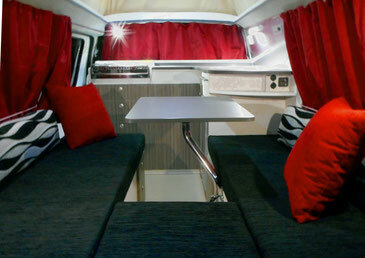 Fibreglass components are a essential part in modern campervan or motorhome conversions. We do fit shower trays, bath room cubicles, gas compartments, pop tops and sliding door conversions. The products are manufactured in Brisbane, using high quality materials. For more pictures and informations visit DIY RV solutions. Ask us for pricing and fitting e.g. sliding door convesions from $3,500. We give you MORE choices in colours!!! Beautiful and natural looking timber grain finishes, easy to clean laminated foils from Bausch Linnemann made in Germany. We are very happy to extend our range of light weight products. The light weight multi plywood also will save you fuel, as it will reduce the weight of the furniture"s in your conversion by over 50%. We moved into a busy and easy to reach location, just off Sandgate road, with train station and easy access to the major highways in Brisbane. Visit us @ our new location in 103 Delta Street / Geebung. Our work shop is bigger and better than before and we welcome you to visit our new office, where we also display new products.